Digimon (デジモン Dejimon, branded as Digimon: Digital Monsters, stylized as DIGIMON), short for "Digital Monsters" (デジタルモンスター Dejitaru Monsutā), is a Japanese media franchise encompassing virtual pet toys, anime, manga, video games, films and a trading card game. The franchise focuses on Digimon creatures, which are monsters living in a "Digital World", a parallel universe that originated from Earth's various communication networks. In many incarnations, Digimon are raised by humans called "Digidestined" or "Tamers" ("Chosen Children" in the Japanese version), and they team up to defeat evil Digimon and human villains who are trying to destroy the fabric of the Digital world. The franchise was first created in 1997 as a series of virtual pets, akin to—and influenced in style by—the contemporary Tamagotchi or nano Giga Pet toys. The creatures were first designed to look cute and iconic even on the devices' small screens; later developments had them created with a harder-edged style influenced by American comics. The franchise gained momentum with its first anime incarnation, Digimon Adventure, and an early video game, Digimon World, both released in 1999. Several seasons of the anime and films based on them have aired, and the video game series has expanded into genres such as role-playing, racing, fighting, and MMORPGs. Other media forms have also been released. Virtual pet model distributed on the Japanese market by Bandai, that allowed the popularization of Digimon in Japan and sold 13 million units worldwide until March 2004. In the year 1996 came the Tamagotchi, created by Akihiro Yokoi, Aki Maita and Takeichi Hongo, which was one of the inspirations for the first release of the franchise, a device marketed in June 1997 with the name Digimon, a short for Digital Monster. Aiming at the male audience and created by Akiyoshi Hongo (a pseudonym that refers to the creators of Tamagotchi), this device shows to players a virtual pet composed entirely of data and designed to play and fight. In February 1998, the DigiMon fighting game, compatible with Windows 95 and developed by Rapture Technologies, Inc., was announced. The one-shot manga C'mon Digimon, designed by Tenya Yabuno, was published in the Japanese magazine V-Jump by Shueisha in 1997. A second generation of virtual pets was marketed six months after the launch of the first, followed by a third in 1998. Each player starts with a baby-level digital creature that has a limited number of attacks and transformations and to make the creature stronger by training and nourishing the creature; when the player is successful in a workout, the Digimon becomes strong, when the player fails, the Digimon becomes weak. Two devices can be connected, allowing two players to battle with their respective creatures, an innovation at the time, however, the battle is only possible from the moment the creature is in the child level or bigger. Playgrounds and subways were where the majority of users of the apparatus were concentrated; The virtual pet was banned in some Asian schools by being considered by parents and teachers as very noisy and violent. The first Digimon were created by Japanese designer Kenji Watanabe, influenced by American comics, which were beginning to gain popularity in Japan, and as such began to make his characters look stronger and "cool." Other types of Digimon, which until the year 2000 totaled 279, came from extensive discussions and collaborations between the Bandai company members. Digimon hatch from types of eggs which are called Digi-Eggs (デジタマ, Dejitama). In the English iterations of the franchise there is another type of Digi-Egg that can be used to digivolve, or transform, Digimon. This second type of Digi-Egg is called a Digimental (デジメンタル, Dejimentaru) in Japanese. (This type of Digi-Egg was also featured as a major object throughout season 2 as a way of Digivolution available only to certain characters at certain points throughout the season.) They age via a process called "Digivolution" which changes their appearance and increases their powers. The effect of Digivolution, however, is not permanent in the partner Digimon of the main characters in the anime, and Digimon who have digivolved will most of the time revert to their previous form after a battle or if they are too weak to continue. Some Digimon act feral. Most, however, are capable of intelligence and human speech. They are able to digivolve by the use of Digivices that their human partners have. In some cases, as in the first series, the DigiDestined (known as the 'Chosen Children' in the original Japanese) had to find some special items such as crests and tags so the Digimon could digivolve into further stages of evolution known as Ultimate and Mega in the dub. The first Digimon anime introduced the Digimon life cycle: They age in a similar fashion to real organisms, but do not die under normal circumstances because they are made of reconfigurable data, which can be seen throughout the show. Any Digimon that receives a fatal wound will dissolve into infinitesimal bits of data. The data then recomposes itself as a Digi-Egg, which will hatch when rubbed gently, and the Digimon goes through its life cycle again. Digimon who are reincarnated in this way will sometimes retain some or all their memories of their previous life. However, if a Digimon's data is completely destroyed, they will die. An exception is partner Digimon, as whilst they can be reborn as many times as needed during their life span, should their partner die - the Digimon permanently dies as well. This is shown with Yukio Oikawa and his Datirimon in Digimon Adventure 02. 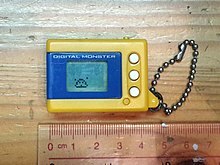 Digimon started out as digital pets called "Digital Monsters", similar in style and concept to the Tamagotchi. It was planned by WiZ and released by Bandai on June 26, 1997. The toy began as the simple concept of a Tamagotchi mainly for boys. The V-Pet is similar to its predecessors, with the exceptions of being more difficult and being able to fight other Digimon v-pets. Every owner would start with a Baby Digimon, train it, evolve it, take care of it, and then have battles with other Digimon owners to see who was stronger. The Digimon pet had several evolution capabilities and abilities too, so many owners had different Digimon. In December, the second generation of Digital Monster was released, followed by a third edition in 1998. On March 6, 1999, the franchise was given an anime as the first of the Digimon movies aired in theaters in Japan. Originally, the Digimon Adventure movie was supposed to be a short film, but after the storyboard was finished, a request for Digimon becoming a children's television show was made. On March 7, 1999, they began airing a television sequel titled Digimon Adventure. Six more series would follow, most of them with their own tie-in movies, and the series was dubbed for release in western markets in the fall of the same year. The show spawned card games, with Hyper Colosseum in Japan and later Digi-Battle in America, and more video games. The animated series is easily the best-known segment of the Digimon universe and responsible for the majority of its popularity. "Digimon" are "Digital Monsters". According to the stories, they are inhabitants of the "DigiWorld", a manifestation of Earth's communication network. The stories tell of a group of mostly pre-teens, who accompany special Digimon born to defend their world (and ours) from various evil forces. To help them surmount the most difficult obstacles found within both realms, the Digimon have the ability to evolve (Digivolve) In this process, the Digimon change appearance and become much stronger, often changing in personality as well. The group of children who come in contact with the Digital World changes from series to series. As of 2016, there have been seven series – Digimon Adventure, the follow-up sequel Digimon Adventure 02, Digimon Tamers, Digimon Frontier, Digimon Data Squad, Digimon Fusion and Digimon Universe: Appli Monsters. The first two series take place in the same fictional universe, but the third, fourth, fifth, sixth and seventh each occupy their own unique world. Each series is commonly based on the original storyline but things are added to make them unique. However, in Tamers, the Adventure universe is referred to as a commercial enterprise – a trading card game in Japan, plus a show-within-a-show in the English dub. It also features an appearance by a character from the Adventure universe. In addition, each series has spawned assorted feature films. Digimon still shows popularity, as new card series, video games, and movies are still being produced and released: new card series include Eternal Courage, Hybrid Warriors, Generations, and Operation X; the video game, Digimon Rumble Arena 2; and the previously unreleased movies Revenge of Diaboromon, Runaway Locomon, Battle of Adventurers, and Island of Lost Digimon. In Japan, Digital Monster X-Evolution, the eighth TV movie, was released on January 3, 2005, and on December 23, 2005 at Jump Festa 2006, the fifth series, Digimon Savers was announced for Japan to begin airing after a three-year hiatus of the show. A sixth television series, Digimon Xros Wars, began airing in 2010, and was followed by a second season, which started on October 2, 2011 as a direct sequel to Digimon Xros Wars. In August 2014, it was announced that a new Digimon Series will start airing in 2015. Celebrating the 15 years of the first series, it will be set in the Digimon Adventure universe, following a 17-year-old Tai and his friends in an all new story. Titled Digimon Adventure tri., the new project was confirmed to be a series of six films, which started release in November 2015. Digimon was produced by Toei Animation and Bandai of Japan. The series were broadcast in Japan by Fuji Television, except for Xros Wars and Appli Monsters , which instead aired on TV Asahi and TV Tokyo. The first four series were called Digimon: Digital Monsters in international markets, while Savers was released as Digimon Data Squad and Xros Wars has been released as Digimon Fusion. The first Digimon television series, which began airing on March 7, 1999 in Japan on Fuji TV and Kids Station and on August 14, 1999 in the United States on Fox Kids dubbed by Saban Entertainment for the North American English version. Its premise is a group of seven kids who, while at summer camp, travel to the Digital World, inhabited by creatures known as Digital Monsters, or Digimon, learning they are chosen to be "DigiDestined" ("Chosen Children" in the Japanese version) to save both the Digital and Real World from evil. Each Kid was given a Digivice which selected them to be transported to the DigiWorld and was destined to be paired up with a Digimon Partner, such as Tai being paired up with Agumon and Matt with Gabumon. The children are helped by a mysterious man/digimon named Gennai, who helps them via hologram. The Digivices help their Digimon allies to Digivolve into stronger creatures in times of peril. The Digimon usually reached higher forms when their human partners are placed in dangerous situations, such as fighting the evil forces of Devimon, Etemon and Myotismon in their Champion forms. Later, each character discovered a crest that each belonged to a person; Tai the Crest of Courage, Matt the Crest of Friendship, Sora the Crest of Love, Izzy the Crest of Knowledge, Mimi the Crest of Sincerity, Joe the Crest of Reliability, T.K. the Crest of Hope, and later Kari the Crest of Light which allowed their Digimon to digivolve into their Ultimate forms. The group consisted of seven original characters: Taichi "Tai" Yagami "Kamiya", Yamato "Matt" Ishida, Sora Takenouchi, Koushiro "Izzy" Izumi, Mimi Tachikawa, Joe Kido, and Takeru "T.K." Takaishi. Later on in the series, an eighth character was introduced: Hikari "Kari" Yagami "Kamiya" (who is Taichi's younger sister). The second Digimon series is direct continuation of the first one, and began airing on April 2, 2000. Three years later, with most of the original DigiDestined now in high school at age fourteen, the Digital World was supposedly secure and peaceful. However, a new evil has appeared in the form of the Digimon Emperor (Digimon Kaiser) who as opposed to previous enemies is a human just like the DigiDestined. The Digimon Emperor has been enslaving Digimon with Dark Rings and Control Spires and has somehow made regular Digivolution impossible. However, five set Digi-Eggs with engraved emblems had been appointed to three new DigiDestined along with T.K. and Kari, two of the DigiDestined from the previous series. This new evolutionary process, dubbed Armor Digivolution helps the new DigiDestined to defeat evil lurking in the Digital World. Eventually, the DigiDestined defeat the Digimon Emperor, more commonly known as Ken Ichijouji on Earth, only with the great sacrifice of Ken's own Digimon, Wormmon. Just when things were thought to be settled, new Digimon enemies made from the deactivated Control Spires created by the evil Arukenimon start to appear and cause trouble in the Digital World. To atone for his past mistakes, Ken joins the DigiDestined, being a DigiDestined himself, with his Partner Wormmon revived to fight against them. They soon save countries including France and Australia from control spires and must fight and defeat the evil MaloMyotismon (BelialVamdemon), the digivolved form of Myotismon (Vamdemon) from the previous series. They stop the evil from destroying the two worlds, and at the end, every person on Earth gains their own Digimon partner. The third Digimon series, which began airing on April 1, 2001, is set largely in a "real world" where the Adventure and Adventure 02 series are television shows, and where Digimon game merchandise (based on actual items) become key to providing power boosts to real Digimon which appear in that world. The plot revolves around three Tamers, Takato Matsuki, Rika Nonaka, and Henry Wong. It began with Takato creating his own Digimon partner by sliding a mysterious blue card through his card reader, which then became a D-Power. Guilmon takes form from Takato's sketchings of a new Digimon. Together they bond with Rika, Henry, and Takato's friends Kenta, Kazu, and Jeri on a quest to rescue Calumon and defeat the evil force called the D-Reaper, who threatens to take over their world. (Tamers' only human connection to the Adventure series is Ryo Akiyama, a character featured in some of the Digimon video games and who made an appearance in some occasions of the Adventure story-line.) Some of the changes in this series include the way the Digimon digivolve with the introduction of Biomerge-Digivolution and the way their "Digivices" work. In this series, the Tamers can slide game cards through their "Digivices" and give their Digimon partners certain advantages, as in the card game. This act is called "Digi-Modify" (Card Slash in the Japanese version). The same process was often used to Digivolve the Digimon, but as usual, emotions play a big part in the digivolving process. Unlike the two seasons before it and most of the seasons that followed, Digimon Tamers takes a darker and more realistic approach to its story featuring Digimon who do not reincarnate after their deaths and more complex character development in the original Japanese. The anime has become controversial over the decade, with debates about how appropriate this show actually is for its "target" audience, especially due to the Lovecraftian nature of the last arc. The English dub is more lighthearted dialogue-wise, though still not as much as previous series. The fourth Digimon series, which began airing on April 7, 2002, radically departs from the previous three by focusing on a new and very different kind of evolution, Spirit Evolution, in which the human characters use their D-Tectors (this series' Digivice) to transform themselves into special Digimon called Legendary Warriors, detracting from the customary formula of having digital partners. After receiving unusual phone messages from Ophanimon (one of the three ruling Digimon alongside Seraphimon and Cherubimon) Takuya Kanbara, Koji Minamoto, Junpei Shibayama, Zoe Orimoto, Tommy Himi, and Koichi Kimura go to a subway station and take a train to the Digital World. Summoned by Ophanimon, the Digidestined realize that they must find the ten legendary spirits and stop the forces of Cherubimon from physically destroying the Digital World. After finding the ten spirits of the Legendary Warriors and defeating Mercurymon, Grumblemon, Ranamon, and Arbormon, they finally end up fighting Cherubimon hoping to foil his effort to dominate the Digital World. After the defeat of Cherubimon, the Digidestined find they must face an even greater challenge as they try to stop the Royal Knights – Dynasmon and Crusadermon – from destroying the Digital World and using the collected data to revive the original ruler of the Digital World: the tyrannical Lucemon. Ultimately the Digidestined fail in preventing Lucemon from reawakening but they do manage to prevent him from escaping into the Real World. In the final battle, all of the legendary spirits the digidestined have collected thus far merge and create Susanoomon. With this new form, the digidestined are able to effectively defeat Lucemon and save the Digital World. In general, Frontier has a much lighter tone than that of Tamers, yet remains darker than Adventure and Adventure 02. After a three-year hiatus, a fifth Digimon series began airing on April 2, 2006. Like Frontier, Savers has no connection with the previous installments, and also marks a new start for the Digimon franchise, with a drastic change in character designs and story-line, in order to reach a broader audience. The story focuses on the challenges faced by the members of D.A.T.S. ("Digital Accident Tactics Squad"), an organization created to conceal the existence of the Digital World and Digimon from the rest of mankind, and secretly solve any Digimon-related incidents occurring on Earth. Later the D.A.T.S. is dragged into a massive conflict between Earth and the Digital World, triggered by a wicked scientist named Akihiro Kurata, determined to make use of the Digimon for his own personal gains and permanently delete them, along with several opponents the D.A.T.S. must face, like the demonic Belphemon, and the tyrannical King Drasil who threaten to destroy both worlds. The English version was dubbed by Studiopolis and it premiered on the Jetix block on Toon Disney on October 1, 2007. Digivolution in Data Squad requires the human partner's DNA ("Digital Natural Ability" in the English version and "Digisoul" in the Japanese version) to activate, a strong empathy with their Digimon, and a will to succeed. Digimon Savers also introduces a new form of digivolving called Burst Mode which is essentially the level above Mega (previously the strongest form a digimon could take). Like previously in Tamers, this plot takes on a dark tone throughout the story and the anime was aimed, originally in Japan, at an older audience consisting of late teens and people in their early twenties. Because of that, along with the designs, the anime being heavily edited and localized for western US audiences like past series, and the English dub being aimed mostly toward younger audiences of children aged 6 to 10 and having a lower TV-Y7-FV rating just like past dubs, Studiopolis dubbed the anime on Jetix with far more edits, changes, censorship, and cut footage. This included giving the Japanese characters full Americanized names and American surnames as well as applying far more Americanization (Marcus Damon as opposed to the Japanese Daimon Masaru), cultural streamlining and more edits to their version similar to the changes 4Kids often made (such as removal of Japanese text for the purpose of cultural streamlining). Despite all that, the setting of the country was still in Japan and the characters were Japanese in the dub. This series was the first to show any Japanese cultural concepts that were unfamiliar with American audiences (such as the manju), which were left unedited and used in the English dub. Also despite the heavy censorship and the English dub aimed at young children, some of the Digimon's attacks named after real weapons such as RizeGreymon's Trident Revolver are not edited and used in the English dub. Well Go USA released it on DVD instead of Disney. The North American English dub was televised on Jetix in the U.S. and on the Family Channel in Canada. Three and a quarter years after the end of the fifth series, a new sixth series was confirmed by Bandai for the Digimon anime, its official name of the series revealed in the June issue of Shueisha's V Jump magazine being Digimon Xros Wars. It began airing in Japan on TV Asahi from July 6, 2010 onwards. Reverting to the design style of the first four series as well as the plot taking on the younger, lighter tone present in series one, two, and four throughout the story. The story follows a boy named Mikey Kudō (Taiki Kudo in Japan) who, along with his friends, ends up in the Digital World where they meet Shoutmon and his Digimon friends. Wielding a Digivice known as a Fusion Loader (Xros Loader in Japan), Mikey is able to combine multiple Digimon into one to enhance his power, Shoutmon being the usual core of the combination, using a technique known as "DigiFuse" ("Digi-Xros" in Japan). Forming Team Fusion Fighters (Team Xros Heart in Japan), Mikey, Shoutmon and their friends travel through the Digital World to liberate it from the evil Bagra Army, led by Bagramon (Lord Bagra in English), and Midnight, a shady group led by AxeKnightmon with Nene as a figurehead before joining the Fusion Fighters. The Fusion Fighters also finds themselves at odds with Blue Flare, led by Christopher Aonuma (Kiriha Anouma in Japan). The second arc of Xros Wars was subtitled The Evil Death Generals and the Seven Kingdoms. It saw the main cast reshuffled with a new wardrobe while Angie (Akari in Japan) and Jeremy (Zenjiro in Japan) stay behind in the Human World; thus making Mikey, Christopher and Nene the lead protagonists as they set off to face the Seven Death Generals of the Bagra Army and AxeKnightmon's new pawn: Nene's brother Ewan (Yuu in Japan). A new evolution known as Super Digivolution was introduced at the end of the first arc. The English dub of the series began airing on Nickelodeon on September 7, 2013, which is produced by Saban Brands. On August 17, 2011, Shueisha's V-Jump magazine announced a sequel set one year later, a third arc of Xros Wars subtitled The Young Hunters Who Leapt Through Time, which aired from October 2, 2011 to March 25, 2012, following on from the previous arc. It focuses on a new protagonist, Tagiru Akashi and his partner Gumdramon who embark on a new journey with an older Mikey, Shoutmon, an older Ewan and the revived Damemon, along with other new comrades as they deal with a hidden dimension that lies between the Human World and the Digital World called DigiQuartz, and a new evil force known as Quartzmon. The series finale reintroduces the heroes of the previous five seasons as they all come together and help the current heroes in the final battle due to the fact that the DigiQuartz is essentially a tear in Space and Time, allowing all of the Digimon universes to converge. Digimon Xros Wars: The Young Hunters Who Leapt Through Time was a nominee for the 2012 International Emmy Kids Awards for "Best Animation". Main article: Digimon Adventure tri. A new Digimon series was announced 30 months after the end of Digimon Fusion at a 15th anniversary concert and theater event for the franchise in August 2014. The series announced the return of the protagonists from the original Digimon Adventure series, most of them now as high school students. A countdown clicking game was posted on the show's official website, offering news when specific clicks were met. On December 13, 2014 the series title and a key visual featuring character designs by Atsuya Uki were revealed with Keitaro Motonaga announced as director with a tentative premiere date of Spring, 2015. However, on May 6, 2015, it was announced that tri. would not be a television series, but rather a 6-part theatrical film series. The films are being streamed in episodic format outside Japan by Crunchyroll and Hulu from the same day they premiere on Japanese theaters. The series is set three years after the events of Digimon Adventure 02, when Digimon who turn rogue by a mysterious infection appear to wreak havoc in the Human World. Tai and the other DigiDestined from the original series reunite with their partners and start fighting back with support from the Japanese government, while Davis, Yolei, Cody, and Ken are defeated by a powerful enemy called Alphamon and disappear without a trace. Tai and the others also meet another DigiDestined called Meiko Mochizuki and her partner Meicoomon who become their friends, until Meicoomon turns hostile as well and flees. After discovering that Meicoomon is the source of the infection, the DigiDestined learn that to prevent the Human and Digital Worlds from being destroyed, the Digital World will be automatically rebooted to stop it, but this event will make their Digimon lose all their memories. After the reboot occurs, and the infection is apparently cleaned, the DigiDestined return to the Digital World and meet their partners in order to restart their bonds with them. When they are attacked by a mysterious man who has used the appearances of Digimon Emperor and Gennai, it is revealed that his master King Drasil wanted to create a new world order without humans and Digimon ever interacting with each other. The reboot of the Digital World was meant to restore every Digimon unable to recompose into Digi-Eggs while Meicoomon's power was meant to turn these Digimon into an army which would destroy humans and conquer the Human World. In order to stop King Drasil's plan, Homeostasis and its servant Hackmon decided to eliminate Meicoomon, who is revealed to have been born from a fragment of Apocalymon's data. The DigiDestined are forced to choose between letting Meicoomon be destroyed or turning against both King Drasil and Homeostasis. But before they can decide, Meicoomon's Mega form Raguelmon fuses with Gatomon's corrupted Mega form Ophanimon Falldown Mode to become Ordinemon who starts to swallow the Human World into the Digital World. The film series also feature all the DigiDestined's partners Digivolve up to the Mega level, a feat only a few of them had achieved previously. In May 2016, a new multimedia Digimon project was announced, composed of two video games, a series of toys, and an anime television series titled Digimon Universe: Appli Monsters. The story is set in a world where, instead of Digimon (except Agumon who appeared in episode 45), there are "Appmon" (shortened for "Appli Monsters"), artificially intelligent beings that are born within mobile apps. The main protagonist is Haru Shinkai, who gets an Appli Drive of his own and unlocks its ability to bring Appmon to life, meeting his future partner, Gatchmon. Together, they must restore the balance between the two worlds that was upset by the computer named Leviathan, after it uses a virus to hack everyone's systems. The Series premiered on October 1, 2016 on TXN and ended on September 30, 2017. There have been nine Digimon movies released in Japan. The first seven were directly connected to their respective anime series; Digital Monster X-Evolution originated from the Digimon Chronicle merchandise line. All movies except X-Evolution and Ultimate Power! Activate Burst Mode have been released and distributed internationally. Digimon: The Movie, released in the U.S. and Canada territory by Fox Kids through 20th Century Fox on October 6, 2000, consists of the union of the first three Japanese movies. Digimon Savers: Ultimate Power! Activate Burst Mode!! A stereoscopic 3D movie, Digimon Adventure 3D: Digimon Grand Prix! (デジモンアドベンチャー3D デジモングランプリ! Dejimon Adobenchā: Dejimon Guran Puri? ), was shown at Harmony Land in Sanrio Puroland in July 2000. The movie was later screened at the 'Tobidasu 3D! Toei Animation Festival' on October 3, 2009 and was later included on a set of DVD works released on February 21, 2010. In the United States, the series premiered in August 1999 on the Fox Broadcasting Company. It was dubbed by Saban Entertainment (later Sensation Animation), and was initially broadcast through Fox Kids. The first four series were collectively retitled Digimon: Digital Monsters. Some scenes from the original version were omitted from the Saban dub, or were modified, in order to comply with Fox's standards and practices which considered several scenes to be inappropriate for the target age group. Often dialogue was changed, and the show became less "serious" in tone compared to the Japanese version, instead featuring more jokes and added dialogue, along with a completely different musical score (usually orchestral music, including music recycled from Saban's Masked Rider) and completely different sound effects, due to licensing issues. Another noticeable change in the dub is in some cases, using different voice actors for different forms of a certain Digimon or in other cases, the actors adopting different voices for different forms, whereas in Japan, the voice actor for the most part merely changes the tone of his/her voice slightly, sometimes being altered for effect (this is especially the case in Season 1). As a cross-promotional stunt, 2001 and 2002 saw Digi-Bowl specials co-produced with Fox Sports; NFL on Fox commentator Terry Bradshaw provided interstitial segments in-between episodes as if the episodes were actually a football game. After Disney acquired Saban during the third series, the first three series moved to the cable network ABC Family, while the fourth (Frontier) premiered on UPN. This was due to a deal between Disney and UPN that had various Disney cartoons airing in lieu of UPN programming it themselves (at first under the name Disney's One Too) which concluded the season Frontier aired. Frontier aired on ABC Family concurrently, and reran (alongside the first three seasons) on that channel and Toon Disney (for the latter under the Jetix branding) for several years after. Digimon Data Squad also had a brief run on Toon Disney/Jetix and successor Disney XD. Disney eventually lost the license to Digimon. Toei Animation has however released an official subtitled version of Digimon Xros Wars. Funimation Entertainment has online streaming rights to subtitled versions of Digimon Adventure 02 and Digimon Tamers. In September 2012, Saban Brands announced it had re-acquired the Digimon franchise. In the U.S. insular area of Puerto Rico, the show was redubbed in Spanish. Saban would acquire the licence for Digimon Xros Wars, with an English version in the works. In February 2013, it was announced that Saban's English version, which localized the series title as Digimon Fusion, would air on Nickelodeon in the United States starting September 7, 2013. After three episodes, the show was moved to Nicktoons starting October 13, 2013. Only the first two seasons of Fusion were dubbed. Digimon Adventure and its two sequels, Digimon Adventure 02 and Digimon Tamers, were added to the Netflix Instant Streaming service in 2013 and 2014 with Japanese audio and English subtitles. Crunchyroll began streaming the English-subtitled version of Digimon Fusion outside Japan in November 2011. The English-localized version of its first season became available on Netflix starting September 13, 2014, followed by the second season on March 8, 2016. After Crunchyroll acquired streaming rights to the dubbed versions and Funimation acquired rights to the subtitled versions, the dubbed versions of Adventure, Adventure 02, and Tamers were briefly removed from Netflix. As of 2017, Crunchyroll is currently streaming the dubbed versions of Adventure, Adventure 02, Tamers, and Frontier, in addition to the subtitled version of Fusion's third season, which didn't receive a dub. The dubbed seasons of Fusion are currently streaming on Netflix. In Canada, the Saban-dubbed series were broadcast on YTV, but only the first 26 episodes of Digimon Fusion were shown. The dubbed version of Data Squad, which was produced for the Disney-affiliated Jetix, aired on Family Channel. In Quebec (where Digimon Adventure aired on TQS, and Digimon 02 on TÉLÉTOON), the show was redubbed in French. A French version of Digimon Tamers aired in France, but not in North America. In the United Kingdom, the American dubbed version of Digimon is broadcast. Digimon first aired in the UK on subscription cable/satellite channel Fox Kids but gained most popularity on terrestrial channel ITV's children's slot CITV from 2001-2002, which broadcast Adventure, Adventure 02 and a small amount of Tamers airing during after school hours. The entirety of Tamers aired on cable/satellite channel Fox Kids from 2002–04. Digimon Frontier (the fourth series/season) never aired in the UK as the show's (then) provider Jetix placed the season on hold. From 2011, Digimon Data Squad (the fifth series/season) airs in the UK on Kix! (the show's sole provider). According to Fox Kids's (2000–03) and Kix's (2010-) BARB Television ratings, Adventure, Adventure 02 & Tamers (with Data Squad in last place) have been the most popular series'/seasons in the United Kingdom and was consistently in the weekly top 10 broadcasts for both channels for new episodes. Broadcast rights and merchandising sub-licensing rights for Digimon Fusion in the UK have been acquired by ITV Studios Global Entertainment, Digimon Fusion has aired since Spring 2014 on Digital Terrestrial Channel, CITV. Digimon has also aired in countries such as Australia, Greece, Portugal, Ireland, the Netherlands, Malaysia, South Africa and most of Latin America among others. After the overwhelming popularity of Pokémon in India and Pakistan, Cartoon Network started to air Digimon in 2004. Later, all 4 series were aired. The Latin American and Brazilian versions of Digimon are licensed and dubbed completely uncensored and uncut from the original Japanese edition until Digimon Data Squad. The first four series were licensed by Cloverway Inc. (since 2000 to 2004), and aired on cable for Fox Kids (first four series) and later on Jetix (only first season) and Disney XD (only fourth and fifth seasons). From 2005, the Digimon franchise licenses were taken over by Toei Animation Inc.. In 2009, Digimon Data Squad was licensed by Toei Animation Inc. and aired on cable for Disney XD since 2010 to 2014. The current season; Digimon Fusion (Saban's version) aired on Cartoon Network in 2014. In the Czech Republic, Digimon aired after the success of Pokémon by the TV Nova but it never got that popular. The first season was taken from America, it had the same dialogues and the soundtrack was just translated (instead of "Digimon, digital monsters, digimon are the champions" it was "Digimon, digitální monstra, digimoních strážců šampion" and so on). The second season, however, was translated from Japanese version (although to keep the continuity with the first season the English dubbed names of the characters were used). Digimon Tamers along with Digimon Frontier got there many years later and it aired by Czech version of Animax. In Sweden, only the first two seasons were dubbed into Swedish and aired on Swedish channel TV3 (2001 to 2003) (Reruns were shown on the Swedish version of Fox Kids and Jetix (from 2002 to 2006), it was a straight dub from the North American English version. After the second season was over, the third season was neither dubbed nor aired on Swedish TV. Digimon could not compete against Pokémon in Sweden. The first three movies were cut and merged into a movie. The fourth movie "Diaboromon Strikes Back" was never released in Sweden. In Serbia, as in Sweden, only two seasons were dubbed into Serbian language and aired in two separate dubs. Very first season was dubbed by Radio Television Belgrade and aired on RTS1 in 2001. In 2007, the first season was dubbed again, but this time by Mirius studio and aired on RTV Pink. The second season launched on RTV Pink, also in 2007 but later took place on Pink Kids in 2008. Third and fourth seasons were planned, but the project pulled out. In Italy, it aired on Rai 2 since September 4, 2000. In Spain, it aired on Antena 3 (only the first season), TVE1, TVE2, Fox Kids, Jetix, Disney XD, Clan TVE, Boing and FDF. In Croatia, it aired on Nova TV and later on Disney XD. In Germany, it aired on RTL II and on Fox Kids and Tele 5. In Slovenia, it aired on Radiotelevizija Slovenija. In Poland, it aired on Fox Kids and later on ZigZap. In Bulgaria, it aired on the Channel Fox Kids. In Ukraine, Digimon Adventure was airing on Novyi Kanal from 2002 to 2004 (3 times) and Digimon Frontier aired on TET (TV channel) in 2008. Digimon first appeared in narrative form in the one-shot manga “C'mon Digimon,” released in the summer of 1997. C'mon Digimon spawned the popular Digimon Adventure V-Tamer 01 manga, written by Hiroshi Izawa, which began serialization on November 21, 1998. A Chinese manhua was written and drawn by Yuen Wong Yu (余 遠鍠 Yu Yuen-wong), who based its storyline on the television series. This adaptation covers Digimon Adventure in five volumes, Digimon Adventure 02 in two, Digimon Tamers in four, and Digimon Frontier in three. The original stories are heavily abridged, though on rare occasions events play out differently from the anime. The Cantonese language version was published by Rightman Publishing Ltd. in Hong Kong. Two English versions were also released. The first one was published by Chuang Yi in Singapore. The second one, which was adapted by Lianne Sentar, was released by TOKYOPOP in North America. The three volumes for Digimon Frontier have been released by Chuang Yi in English. These have not been released by TOKYOPOP in North America or Europe. However, the Chuang Yi releases of Digimon Frontier were distributed by Madman Entertainment in Australia. Dark Horse Comics published American-style Digimon comic books, adapting the first thirteen episodes of the English dub of Digimon Adventure in 2001. The story was written by Daniel Horn and Ryan Hill, and illustrated by Daniel Horn and Cara L. Niece. The Italian publishing company, Panini, approached Digimon in different ways in different countries. While Germany created their own adaptations of episodes, the United Kingdom (UK) reprinted the Dark Horse titles, then translated some of the German adaptations of Adventure 02 episodes. Eventually the UK comics were given their own original stories, which appeared in both the UK's official Digimon Magazine and the official UK Fox Kids companion magazine, Wickid. These original stories only roughly followed the continuity of Adventure 02. When the comic switched to the Tamers series the storylines adhered to continuity more strictly; sometimes it would expand on subject matter not covered by the original Japanese anime (such as Mitsuo Yamaki's past) or the English adaptations of the television shows and movies (such as Ryo's story or the movies that remained undubbed until 2005). In a money saving venture, the original stories were later removed from Digimon Magazine, which returned to printing translated German adaptations of Tamers episodes. Eventually, both magazines were cancelled. The player battles with three Digimon: Rosemon, WarGreymon, and SkullGreymon. The opponent's Digimon are Ninjamon, Centarumon, and SandYanmamon. Battling is an integral concept of the Digimon video game series and media franchise. The Digimon series has a large number of video games which usually have their own independent storylines with a few sometimes tying into the stories of the anime series or manga series. The games consists of a number of genres including life simulation, adventure, video card game, strategy and racing games, though they are mainly action role-playing games. The games released in North America are: Digimon World, Digimon World 2, Digimon World 3, Digimon World 4, Digimon Digital Card Battle, Digimon Rumble Arena, Digimon Rumble Arena 2, Digimon Battle Spirit, Digimon Battle Spirit 2, Digimon Racing, Digimon World DS, Digimon World Data Squad, Digimon World Dawn and Dusk, Digimon World Championship, and Digimon Masters. In late 2009, Bandai created a webpage in Japanese showing a new game to be released in 2010 called Digimon Story: Lost Evolution, which uses the same engine as their predecessors Digimon World DS and Digimon World Dawn and Dusk and was released on July 1, 2010. In February 2010, a website for the online multiplayer game, Digimon Battle Online, was launched, showing it to be based primarily in the world of the Tamers saga and its characters. On September 22, 2011, online game publisher Joymax announced the release of an MMORPG game called Digimon Masters, which was developed by the Korean publisher DIGITALIC. 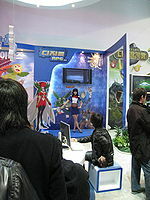 A presentation at a Digimon RPG booth in South Korea. In 2011, Bandai posted a countdown on a teaser site. Once the countdown was finished, it revealed a reboot of the Digimon World series titled Digimon World Re:Digitize. An enhanced version of the game released on Nintendo 3DS as Digimon World Re:Digitize Decode in 2013. A new fighting game for PlayStation 3 and Xbox 360 was revealed in the summer of 2014, named Digimon All-Star Rumble. It was released in North America, Europe and Australia in November of the same year. Digimon Story: Cyber Sleuth, a role-playing game in the Digimon Story sub-series, was released in 2015 for PlayStation Vita and PlayStation 4 in Japan. It has also been released with English subtitles in North America and the rest of the world in 2016. The Digimon Collectible Card Game is a card game based on Digimon, first introduced in Japan in 1997 and published by Bandai. The third season (Digimon Tamers) utilized this aspect of the franchise by making the card game an integral part of the season. Versions of the card game are also included in some of the Digimon video games including Digital Card Battle and Digimon World 3. Akiyoshi Hongo: Creator of the original Digimon concept. Hiroyuki Kakudō: Director of Digimon Adventure and Digimon Adventure 02. Yukio Kaizawa: Director of Digimon Tamers and Digimon Frontier. Naozumi Itō: Director of Digimon Savers. Tetsuya Endo: Director of Digimon Xros Wars. Jeff Nimoy: U.S. Director of Digimon Adventure, Digimon Adventure 02, and Digimon Data Squad (Savers). Mary Elizabeth McGlynn: U.S. Director/Writer/Editor of Digimon Tamers and Digimon Frontier. Chiaki J. Konaka: Head writer of Digimon Tamers. Riku Sanjo: Head writer of Digimon Xros Wars. Hiroshi Izawa: Author of the Digimon Adventure V-Tamer 01 manga. Tenya Yabuno: Illustrator of the Digimon Adventure V-Tamer 01 manga. Yuen Wong Wu: Writer and illustrator for the Digimon manhua series. Takanori Arisawa: Composer of the Japanese versions of Digimon Adventure, Digimon Adventure 02, Digimon Tamers and Digimon Frontier. Keiichi Oku: Composer of Digimon Savers. Kousuke Yamashita: Composer for the Japanese version of Digimon Xros Wars. Shuki Levy: Composer for the English language releases of Digimon Adventure, Digimon Adventure 02 and Digimon Tamers. Deddy Tzur: Composer for the English language release of Digimon Frontier. Thorsten Laewe: Composer for the English language release of Digimon Data Squad (Savers)". Paul Gordon: Co-Composer for the English language theme song. Kouji Wada: Performer of the opening themes of Digimon Adventure, Digimon Adventure 02, Digimon Tamers, Digimon Frontier, the second opening theme of Digimon Savers, and the evolution song of Digimon Xros Wars. ^ a b c d e f g Pixelmood. "Pixelmood - Digimon". Tamatalk. Retrieved 22 March 2014. ^ "New Digimon for 2005". Anime News Network. 25 May 2004. Retrieved 23 March 2014. ^ a b Takato e GlassHeart (21 March 2014). "Dossier (Digimon) — première page (Introduction)" (in French). Manga News. Retrieved April 9, 2014. ^ Thierry Chèze. "Cinq choses à savoir sur Mamoru Hosoda" (in French). L'Express. Retrieved 11 April 2014. [...] un film dérivé de la saga Digimon Adventure, sorte d'ancêtre des Tamagotchi. ^ "Radica Games Limited Announces Manufacturing Agreement For New Innovative Digimon Product". PR Newswire. Retrieved 29 March 2014. ^ a b c d Matt Richtel. "From Virtual Pet to Virtual Pit Bull: Fighting Cyber Toys". New York Times. Retrieved March 22, 2014. ^ Dedpool (March 28, 2013). "DVD Review: Digimon Adventure – Volume 2". BeyondHollywood.com. Archived from the original on April 1, 2014. Retrieved March 28, 2014. ^ "Pokémon, G-Boy Lead Parade of Toys at Fair". March 2000. p. 60. Retrieved April 18, 2014. ^ David Zdyrko (5 July 2000). "Digimon World. We promise not to say the word Pokemon at all in this entire review". IGN. Retrieved March 23, 2014. ^ Tiphaine Clotault (10 December 1997). "Le nouveau Tamagotchi sera sexué. Une gamme pour assurer la rente du fabricant" (in French). Libération. Retrieved April 11, 2014. ^ Bandai Digital Entertainment Corp. (17 February 1998). "Bandai Digital Entertainment Ready To Rumble in June with DigiMon CD-ROM". The Free Library. Retrieved 15 April 2014. ^ "Digimon C'mon" (in Czech). digitalnimonstra.cz. Archived from the original on 2014-04-13. Retrieved 22 March 2014. ^ "Reprenons au début". Digimon France. Retrieved 7 November 2010. ^ Lesley Aeschliman. "Digimon". Bella Online. Retrieved 9 May 2014. ^ "DigiMon Virtual Pet Page". virtualpet.com. Retrieved 24 June 2010. ^ Sarah Ryle (14 May 2000). "Digital pests invade Britain". The Guardian. Retrieved 15 April 2014. '^ Ruki Sayid (15 May 2000). "Digimons coming; New monster toys may KO Pokemon". The Mirror. The Free Library. Retrieved 15 April 2014. ^ "『デジモンワールド リ：デジタイズ デコード』 イラストレーターインタビュー！" (in Japanese). 5 July 2013. Retrieved 12 February 2014. ^ TV.com. "Digimon: Digital Monsters". TV.com. Retrieved 2012-08-15. ^ Graeber, Laurel (August 29, 1999). "COVER STORY; Masters of the Universe, Youth Division". The New York Times. ^ a b c Clements, Jonathan; McCarthy, Helen (2006). The Anime Encyclopedia. California: Stone Bridge Press. ISBN 1-933330-10-4. ^ "New Digital Monsters/Digimon TV Anime Listed". Anime News Network. Retrieved 2012-08-19. ^ "Digimon Adventure Anime Returns Next Spring in High School Sequel". Anime News Network. Retrieved 2014-08-01. ^ "Digimon Frontier Story and Characters". Animeadmirers.com. Retrieved 2013-04-22. ^ "Digimon: The Shining Evolution". Shiningevo.ultimatedigimon.com. Retrieved 2013-04-22. ^ "New Digital Monsters/Digimon Anime TV Listed". Anime News Network. 2010-04-02. Retrieved 2010-04-14. ^ "New Digital Monsters/Digimon TV Anime's Image Posted". Anime News Network. 2010-04-05. Retrieved 2010-04-14. ^ "Digimon Xros Wars Anime to Get 2nd Year This October - News". Anime News Network. 2011-08-17. Retrieved 2012-08-15. ^ "News - News - Item Detail - International Academy of Television Arts & Sciences". Iemmys.tv. Retrieved 2013-04-22. ^ "Digimon Adventure Anime Returns Next Spring in High School Sequel - News". Anime News Network. 2014-08-01. Retrieved 2014-12-13. ^ "New Digimon Anime's Staff, Key Visual, Title Unveiled - News". Anime News Network. 2014-12-13. Retrieved 2014-12-13. ^ "Crunchyroll to Stream Digimon Adventure tri. Anime on Friday". Anime News Network. November 19, 2015. Retrieved November 20, 2015. ^ "Forum - Crunchyroll Presents: Digimon Adventure Tri". Crunchyroll. November 23, 2015. Retrieved November 27, 2015. ^ "'Digimon Adventure Tri' Anime Begins Hulu Distribution". The Fandom Post. December 21, 2015. Retrieved January 17, 2016. ^ "Digimon Adventures tri. is 6-Part Theatrical Anime with New Cast". Anime News Network. May 6, 2015. Retrieved 6 May 2015. ^ "Digimon Adventure tri. Movies 2 and 3 Trailer". Den of Geek. Retrieved January 20, 2016. ^ "Digimon Adventure tri. Anime's 4th Film Opens on February 25". Anime News Network. Retrieved September 24, 2016. ^ "Digimon Adventure tri. Anime's 5th Film to Open This Year". Anime News Network. Retrieved February 25, 2017. ^ "Digimon Universe: Appli Monsters cross-media project officially announced". Gematsu. Retrieved 20 May 2016. ^ "Digimon Universe: Appli Monsters Announced For 3DS, Info On Its Upcoming Anime, And More". 9 June 2016. ^ Crowe, Deborah (September 25, 2012). "Saban Brands Acquires Digimon Anime Brand". Los Angeles Business Journal. Retrieved September 26, 2012. ^ "Saban Brands Acquires Digimon Anime Franchise". AnimeNewsNetwork. September 25, 2012. Retrieved September 26, 2012. ^ Sarah (September 25, 2012). "Saban Brands Acquires Digimon Brand". BSCKids. Archived from the original on September 28, 2012. Retrieved September 26, 2012. ^ "Nickelodeon dives into Digimon | News". C21Media. Archived from the original on 2013-04-16. Retrieved 2013-04-22. ^ "Crunchyroll to Stream Digimon Xros Wars Anime". Anime News Network. November 2, 2011. ^ "Viewing Data Top 10s". BARB (Broadcasters' Audience Research Board). Retrieved 16 January 2013. ^ Clancy, Michelle. "ITV to broadcast Digimon Fusion anime in 2014". Rapid TV News. Retrieved 22 October 2013. ^ Dickson, Jeremy. "ITV licenses Digimon Fusion". Kidsscreen. Retrieved 22 October 2013. ^ "Lianne Sentar's Other Published Works/Works List". Liannesentar.com. 2011-10-23. Retrieved 2012-08-19. ^ Horn, Daniel; Ryan Hill (2001). Digimon: Digital Monsters. illustrated by Daniel Horn, Cara L. Niece. Dark Horse Comics. ISBN 1-56971-516-5. ^ "Digimon Battle- The Journey Begins. To the Digital World". Digimonbattle.wemade.net. Retrieved 2012-08-15. ^ "Digimon Masters OBT Sept 27th - iMMOsite get your gaming life recorded". my.mmosite.com. 2011-09-22. Retrieved 2012-08-15. ^ Romano, Sal. "Digimon World Re: Digitize a "return to origins"". Gematsu. Retrieved 7 August 2014. ^ Romano, Sal. "Digimon World Re: Digitize Decode announced for 3DS". Gematsu. Retrieved 7 August 2014. ^ "DIGIVOLVE WITH BANDAI NAMCO GAMES EUROPE'S DIGIMON ALL-STAR RUMBLE IN EUROPE AND AUSTRALASIA THIS FALL". Gamasutra. ^ Romano, Sal. "First look at Digimon Story: Cyber Sleuth". Retrieved 7 August 2014. This page was last edited on 13 March 2018, at 01:18.